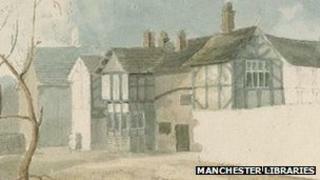 Manchester Metropolitan University is holding a public archaeology dig on the site of its new campus. The team, at Birley Fields in Hulme, is trying to find the remains of a medieval farm and the foundations of terraced houses built during the Industrial Revolution. Dr Faye Simpson from the department of history said the dig was exciting. "We know from mapwork and historical documents that there is definitely stuff on the land," she said. Dr Simpson said the earliest survey of Hulme is a map from 1786 that marks Hulme Hall on the south-western fringe of Manchester and farmsteads including Hulme Farm and Jackson's Farm. The excavation is targeting the site of Jackson's Farm and the houses that occupied the site from the later 19th Century, as well as the site of Holy Trinity Church. Dr Simpson said: "This was a massive workers' houses area, it had churches, it had a whole community and now it's an empty space. "The first stage is to look at the terraced houses and find out what the rooms were for, who lived in them and what objects they've left behind and then we'll go down deeper. "We'll go through layer by layer." Dr Simpson said any objects that they find will be exhibited at the university. The university is planning to move to Birley Fields by 2014.